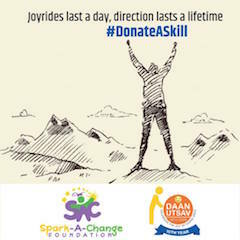 As the nation joins hands to uplift the underprivileged, Spark-A-Change Foundation gives you an opportunity to ‘Donate A Skill’ and empower the youth. You can conduct workshops OR connect us with talented professionals OR sponsor a hobby class for our children. Come, join in the festivities of Daan Utsav week scheduled from 2nd to 8th October 2018.